Show Schedule for Thursday May 29, 2014. 8:30AM-6:00PM Registration Desk for T.R.A.F.F.I.C. West 2014 is open! Prepare for big business, T.R.A.F.F.I.C. style! 9:00AM-10:00AM A lavish feast fit for the domain investor attending T.R.A.F.F.I.C.! Celebrate the coming days of hard work and opportunity by breaking bread with like-minded folks looking to accomplish big things. This is one of the secrets behind what we do. 9:45AM We ask for about 15 minutes of your time to set the stage for the days to come and where we are as an industry and where we are headed. Then we get out of the way and allow you to make BIG things happen. Things that you could only do at T.R.A.F.F.I.C. because we all have skin in the game, and Howard and I got your back covered. Being Oscar! Exclusive book signing with renowned mob lawyer and former Las Vegas mayor. TIME FOR THIS SEMINAR WILL CHANGE! WATCH THE SCHEDULE FOR UPDATES. 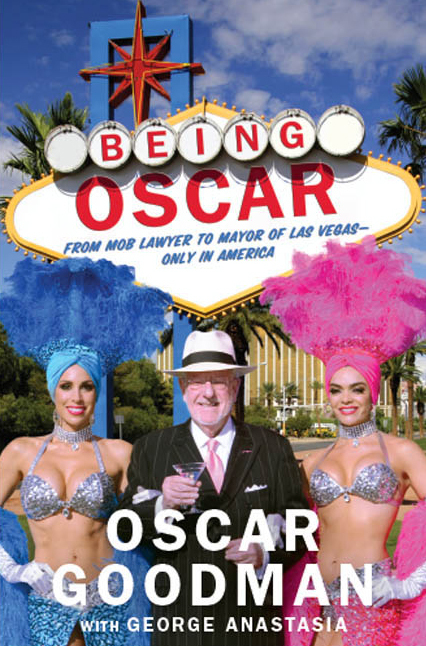 "Being Oscar" is a new book by the one-time mob lawyer, Oscar Goodman, the very same Oscar Goodman who eventually became the mayor of Las Vegas during the 1990's. 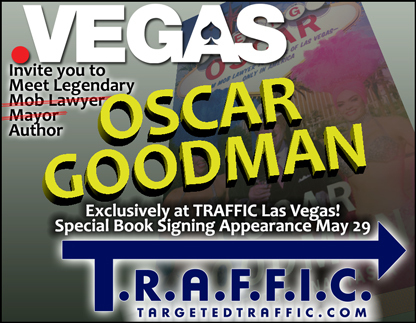 The guys at .Vegas have used their influence to bring Mr. Goodman to T.R.A.F.F.I.C. for an exclusive book signing at the show on Thursday, May 29. The time is still TBA, but rest assured, this is one Vegas character you do not want to miss! Be certain to keep your eye on this schedule for updates and your chance to mingle with the man who has played a role in Las Vegas' more - how shall we say it? - notorious historical dramas! 10:15 - 11:15 Search with Duane Forrester from Bing. Slaying the Google Giant. Duane Forrester Sr. Product Manager at Bing has over 15 years’ experience in the search and social fields. He is the author of How To Make Money With Your Blog and Turn Clicks Into Customers, through McGraw-Hill. Along the way, Duane has worked in marketing & PR with Caesar’s Palace, run his own websites, communities and consultancy, worked for small and enterprise publishers online and currently works with Bing where he helps run their Webmaster program. Prior to this, he ran the SEO program at MSN. Past work also included writing for SearchEngineLand.com, moderating in the original SearchEngineForums.com and being a Board member with SEMPO, where he founded the InHouse Committee and SEMPO’s annual Industry Salary Survey. 11:30AM - 12:30PM Neil Sackmary will make a presentation that may just rock the industry. New tools for domainers, including being able to sell sub-domains in real time on your own domains as well as automated stores, ad placements, PPC, eBay tools, Traffic Splitter, AND software to allow you to have a "Buy it now" button" and also "Make an offer" button. If they make an offer that matches your parameters, it automaically takes the sale. PLUS other tools domainers have NEVER had!! This hour will pay your entire show cost. 12:30PM -1:30PM gTLD Shootout. gTLD operators in Attendance have 5 minutes of podium time to Speak. Jothan Frakes Moderates. 12:45PM-1:30PM gTLD Shootout moderated by Jothan Frakes. Each gTLD operator in attendance that chooses, and has confidence in what they are selling, has up to 5 minutes of podium time to tell attendees why their new extension is worthy of your investment dollars. The single best opportunity they may ever get to be in front of the #1 domain investing audience in the world, and all they have to do is show up! .Vegas, .Club, .Link, .Global and more!!! 1:30PM-2:30PM No better way to network than to break bread with your fellow attendees. Join Frank Schilling and his team for lunch. 2:30PM thru 2:45PM Neil Sackmary of GetitFido.com will present a new monetization program for domainers for the very first time. Neil wound up building his own private monetization platform AS AN END USER for HIS OWN BUSINESS and developing his own direct advertiser relationships, rather than rely on Google, as most PPC operations do. The result: Higher and more consistent payouts. Neil will also tell you about the big party tonight! 2:45PM-3:45PM You heard their pitch. Now what? Michael Cyger of DomainSherpa.com will moderate this provocative panel. We all have friends involved with the new gTLD's and we don't want to say anything negative, but our top-tier group of outspoken domainers will get past that and logically handicap the rollout of all the gTLD's. Plus, they'll discuss which ones have the most likely chance of wide adaptation and increasing values. How long that will take? Then, go a step beyond, and measure it against traditional extensions, and their time vs return and risk vs reward ratios. Not all gTLD's are created equal. Some think these gtld's will be on fire; yet, others think they will fizzle out. 4:00-5:00 DomainSherpa LIVE! Michael Cyger with Michael Berkens, Page Howe, Adam Dicker, Rick Schwartz and special guest Jothan Frakes. The weekly DomainSherpa show will take the stage live and engage YOU! The Sherpa has no problem mixing it up, and both sides will always present valid points to consider. 5:15PM - 6:15PM How to take a domain to business in 60 minutes, with Adam Dicker and moderated by Michael Cyger. Right in front of your eyes. This seminar can pay for your admission 10x over. Stop selling domains, and start creating and selling businesses! 9PM-Midnight The famous T.R.A.F.F.I.C. party sponsored by GetitFido.com!!! GetItFido founder Neil Sackmary is a friend of hot rock band and Century Media recording artists, Otherwise, who is based in Las Vegas, and Sackmary has arranged for them to play live at the T.R.A.F.F.I.C. Party. Otherwise, who has released three albums and an EP, made their big breakthrough with their 2012 album True Love Never Dies that includes their biggest hit to date - "I Don't Apologize (1,000 Pictures)". Read Ron Jackson's Lowdown story at DNJournal.com.